Background: Stereotactic body radiotherapy (SBRT) has well described in the treatment of spine metastatic disease. There is limited date available on SBRT for non-spine bone metastatic disease. Methodology: Retrospective review of prospective SBRT database looking at pain control for non-spine osseous targets. Results: Eleven patients had 15 SBRT treatments for non-spine osseous metastatic disease. Thirteen of 15 (86.7%) treatments resulted in complete pain relief, one patient with treatment to two sites had recurrence outside but nearby the treated area. Including use of re-treatment all patients achieved complete pain control. One patient had a bone fracture from SBRT (9.0%). Conclusion: The SBRT in the treatment of non-spine osseous metastatic disease has good pain control. However, toxicity and marginal failure was founded. The two marginal failures raise the question of margins that should be used in this setting. Future study should focus on margins and collection of toxicity data. Radiation therapy has been a common palliative treatment of symptomatic bone metastases. It has been shown to reduce pain in 50-80% of patients and provide complete pain relief in 20-50% of patients1-3. Multiple studies have focused on finding the optimal dosing and schedule for treatment. Hartsell et al.4 conducted a prospective study, where they randomized treatment between 8 Gy delivered in a single fraction and 30 Gy in 10 fractions. This study found that, both regimens were equivalent in terms of pain and narcotic relief and well tolerated with few adverse effects. The shorter 8 Gy arm had a higher re-treatment rate but less acute toxicity than the longer 30 Gy arm4,5. The trans-tasman radiation oncology group (TROG 96.05), randomized between 8 Gy in a single fraction and 20 Gy in 5 fractions found the prolonged course to be superior in terms of overall response rate and time to treatment failure6. Short course radiation is more convenient for patients and care-givers as compared to a more prolonged radiation course. The optimal treatment would be one that allows the advantages of higher doses (decreased re-treatment rate and improved response rate) with the logistic simplicity of limited fraction radiation. While, the dose for conventional radiation is limited by concerns regarding precision and immobilization, stereotactic body radiotherapy (SBRT) is a newer technology that allows for higher radiation doses to be delivered in a limited number of fractions. The SBRT has been used primarily in the treatment of osseous metastatic disease to the spine, the high degree of precision with SBRT makes it ideal for this treatment since the target volume is very close to the spinal cord. The SBRT has been shown to be effective in controlling and reducing pain significantly for patients with spinal metastases, both as single and multiple sessions7-9. While, these studies continue to show the palliative effectiveness of stereotactic radiotherapy on bone metastases, they largely focus on metastases of the spine9. While, occasionally a study includes non-spinal metastases, it is included indiscriminately with the spinal lesions10. There is limited information on the effectiveness of SBRT on non-spinal metastases. The purpose of this study is to explore the palliative effectiveness of SBRT on non-spinal bone metastases. Study: This is a retrospective study of a prospective IRB database. Population: A total of 108 treatments to bone metastatic disease treatments were analyzed. From this cohort, 11 patients and 15 treatments were found to fit this eligibility criteria for non-spinal bone metastases treated with SBRT. Eligibility required that patients had diagnosed metastatic bone disease causing pain to the affected area and were treated with SBRT. Patients were excluded if no follow-up data was available. The patients were treated and monitored at one institution. Treatments took place between January, 2010 and December, 2015. The population consists of 6 females and 5 males with a median age of 57 (range 41-77). Four patients had metastases from breast cancer, 3 from colon cancer, 2 from lung cancer, 1 from sarcoma and 1 from renal cancer. The target treatments included ribs (6), scapula (3), sternum (2), pubic bone (2), chest wall (1) and extremity (1). Two patients had treatment to multiple sites. Eight of the patients had chemotherapy prior to the radiosurgery and one patient had surgery to the area prior to treatment. Three patients previously had radiation to the region. Five patients had other areas of metastatic disease outside the treated site. The patients had a median KPS of 90 (range 70-100). Pain was patient described based on a scale of 1-10 with 10 being worst pain imaginable. All patients experienced bone pain in the region prior to the radiotherapy with a median pain score of 8 (range 5-10). Two patients described "significant pain", but no number score is given. No patients experienced neurological symptoms prior to treatment (Table 1). Treatment: Treatment involved SBRT using the Cyberknife radiosurgery system (Accuray, Sunnyvale, CA). Patients required implanted or external fiducial markers for radiosurgery tracking. The type of fiducial used was at discretion of treating physician. Targets were outlined using CT based planning. Secondary imaging such as PET or MRI would be used when available. Use of a PTV margin was variable, 5 treatments were to the GTV only, while 9 had a margin around the GTV (typically 2-5 mm). Treatment was prescribed to an isodose line with the median isodose line being 72 and a range of 63-86. The median number of fractions was 4.5 (range 1-5) and median dose was 30 Gy (range 12-60 Gy), biological equivalent dose (in 2 Gy equivalent) had a median of 60 Gy (range 26.4-100 Gy). Follow-up: Follow-up exam included a complete history and physical exam and imaging if felt to be clinically relevant. At first follow-up (typically scheduled for 4 weeks after treatment) and at all additional follow-up appointments, patients were again asked to rate their pain. Patients were asked the severity and location of pain. Pain that developed outside the treated area was scored separately. Median follow-up for all patients was 180 days (range 47-829 days). Patients were evaluated for pain at first follow-up, which was at a median 37 days (range 12-35 days) and at last follow-up. All patients reported pain improvement at first follow-up with 11 treatments resulting in complete pain relief and 4 treatments resulting in partial pain relief. At the time of most recent follow-up, all patients had complete pain relief but this includes use of salvage treatment in one patient. This patient, who had treatment to the rib lesion and pubic bone lesion had marginal failure and had recurrent pain resulting in a second course of radiosurgery to both areas (Fig. 1). The failures occurred 513 and 367 days after the initial treatment, respectively. It should be noted that the patient with marginal failure had a margin of 2 mm around the GTV to generate a PTV. The same patient also had a pathologic fracture of the pubic bone as a result of the first SBRT procedure (Fig. 2). Thirteen of 15 treatments resulted in complete pain control (86.7%). Other than the pathologic fracture, no other toxicity occurred and overall toxicity rate was 9.0%. The SBRT has been well studied in the treatment of spine metastatic disease. Several studies have found long-term pain control in 84-86% of cases11,12. There is limited information regarding SBRT for non-spine metastatic disease. The data is often combined with spinal studies indiscriminately. Napieralska et al.10 reported successful pain control for bone metastases from prostate cancer using SBRT. This study combined data from the spine with treatments to the skull and pelvis and reported 90% overall pain control for all patients. McDonald et al.13 reported on evaluation of response criteria for non-spine metastatic disease treated with SBRT and found that there is a discrepancy in local control depending on the radiographic response criteria that was used (RECIST versus University of Texas MD Anderson Cancer Center criteria). We do not routinely perform follow-up imaging on these patients, the treatment in all cases was palliative with goal of reducing pain. For this reason, pain control was the only metric that was felt to be clinically useful. Using pain response as a response metric, it was found that 71% of patients had complete pain control at the time of first follow-up, which increased to 100% with continued follow-up (including use of repeat treatment). This results are similar to what would be expected for spine SBRT. It was found adequate pain control in 13 out of 15 treatments (86.7%) and for initial treatment, 10 out of 11 patients (90.9%). These results are similar to what would be expected with SBRT to spine. One patient with metastatic breast cancer had marginal failure with recurrent pain in both the rib and pubic bone treated site. Figure 1 and 2 show the area of recurrence was within the pubic bone but several centimeters away from the initially treated lytic lesion. There are obvious flaws with this series, the number of patients treated is limited and although they all have non-spine metastatic lesions there is heterogeneity in the targets treated as well as radiation doses and fractions. Also, this is in part retrospective with all the flaws inherit in such studies. However, this study is valuable for several reasons. First, this is one of the few studies to report on response to non-spine SBRT treatments. While, there are many publications regarding spine SBRT, data for non-spine treatments are more limited. This technology is likely to be increasingly utilized and this creates a need for effectiveness data. Another important feature of this series is describing the patient with local failure, while treatment volumes for spine SBRT are well defined14 there is no consensus on target definition for non-spine SBRT. It is possible that the 2 cases of failure would not have occurred if a larger margin had been used. Conventional radiation uses relatively large fields and may have covered the nearby areas that had subsequent failure. Future reports and prospective SBRT studies will need to carefully consider margins and how to define targets. Furthermore, this is the first report of toxicity in non-spine SBRT. While toxicity (vertebral body compression fracture) for spine SBRT is noted to occur in approximately 14% of patients15, there is no data regarding toxicity for non-spine SBRT. One of the patients (9.0%) in this series had a pathologic fracture secondary to the radiation. 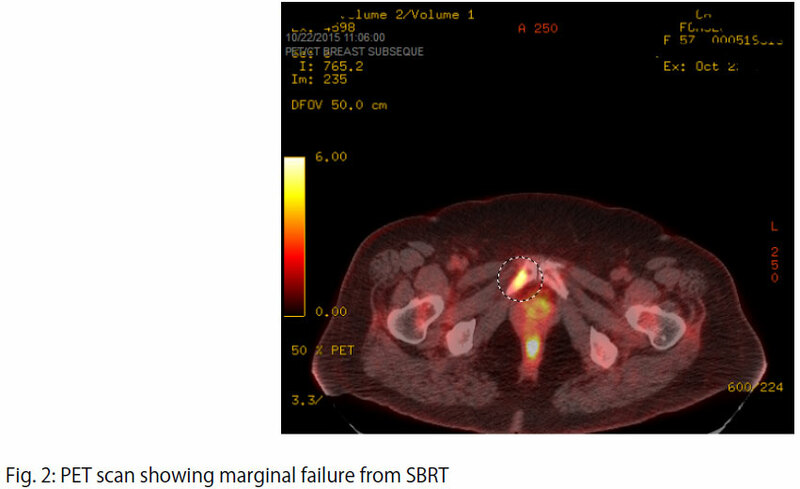 The SBRT for non-spine osseous metastatic disease has high pain control rates, similar to spine SBRT but there are concerns regarding treatment failure rates and toxicity rates. We found two cases of failure close to treated area (marginal miss), which raises the question regarding appropriate margins for this treatment technique.